The Golden Apricot International Film Festival ended Sunday and Armenia’s first attempt at big-time production was met with mixed reviews. While outsiders kindly commented on the inaugural undertaking, some behind the scenes complained that, overall, the program lacked careful organization. 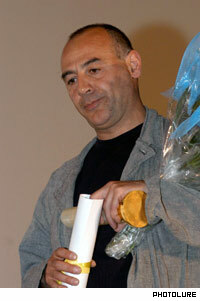 Gevorg Parajanov, nephew of Sergey was among award winners.. Most, though, agreed that for a first effort, it was a good one. “This is a first attempt and first step but believe me that your festival was born this year and other ones will be walking with a firm thread and in the future people will be talking about them,” said jury member Peter van Bueren, from Amsterdam. Over four days of film after film after film (around 200, including all categories), it is little wonder that some demonstration films played to almost-empty theaters – especially considering that they starting screening at 9:30 a.m. The lineup of movies included the best recent Swedish, Italian, German and Bulgarian films as well as award-winning movies of the Rotterdam International Film Festival, which were shown under the title “Yerevan Premieres”. The 80th anniversary of the Hayfilm Studios was celebrated with a retrospective of films in honor of which an exhibition of Armenian film painters was opened in the Union of Painters of Armenia. Sergey Parajanov’s 80th anniversary was celebrated with significant measures. The director’s wife Svetlana Sherbatiuk and son Suren Parajanov were present at the celebration. Premiere of the movie “I Died When I Was A child” of Gevorg Parajanov dedicated to Sergey Parajanov took place on July 4 at the “Nairi” Cinema Theatre. Actress Sofiko Tchiaureli, who starred in Parajanov’s movie “Color of Pomegranate” and some of her friends also came to celebrate Parajanov’s 80 th anniversary. Within the frameworks of the festival Charles Aznavour’s 80 th birthday was celebrated with Truffaut’s “Shoot the Pianist” and Andre Cayatte’s “Rhine Passage”, in which Aznavour plays the leading roles. At closing ceremonies July 4, 14 directors were awarded marble statues with engraved golden apricots. Feature Film: Atom Egoyan (Canada), “Ararat”. Special prize: Arthur Aristakesyan ( Russia), “Place on the Earth”. Documentary: Armen Khachatryan (Armenia), “Tale About Pegasus”. Special prize: Kristiina Davidjants (Estonia), “ Intimate Town”. Animation and Experimental: Stéphane Elmadjian, “Freedub 1”. Special prize: Serge Avedikian, “Lines of Life”. Student Debut: Maria Sahakyan (Armenia-Russia), “Farewell”. Video Art: Diana Hakobyan ( Armenia), “I Don’t Believe Your Dreams”. The Armenian Association of Film Critics and Cinema Journalists awarded a special prize to director Edgar Baghdasaryan (Armenia) for “The Land of Holy Rites”.